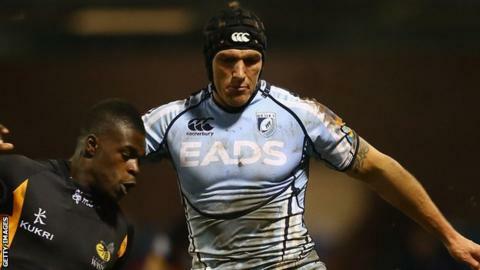 Wales winger Tom James is to leave Cardiff Blues and join Exeter in the summer after agreeing a two-year deal. James, 25, ends a seven-year spell in Cardiff and is Exeter's first new signing for the 2013-14 season. "We are delighted to have got Tom on board," said Exeter boss Rob Baxter. "We've had a good look at Tom over a period of time and for us it's difficult to ignore proven try-scorers, who have got a very good ability to break the gain line," Baxter added. James has won 10 caps for Wales, the last against New Zealand in November 2010 and signed a contract extension at Cardiff two years ago. "Signing for Exeter Chiefs is a great move for me," said James. "They are a team that I've watched come up to the Premiership over the last few years and do really well. "I've had a fantastic seven years with the Blues and I am very grateful to have been given the opportunity to play for them and for the support I've been shown over my career. "There are many highlights I've had, including winning the EDF Energy and Amlin Challenge Cups, but I felt the time was right for a fresh challenge." Cardiff boss Phil Davies praised James' work at Blues and sent the winger to England with his blessing. He said: "It has been a pleasure to work with Tom over the past eight months. "He takes a very professional approach to his training and conditioning and has been a real asset to the team over a number of years and to me personally this season. "However, we understand his reasons for leaving and wanting to face a fresh challenge and we wish him the best of luck with his rugby career at Exeter Chiefs." And Baxter has backed James to add to his tally of caps for Wales if he can impress at Sandy Park. "Obviously he has played for Wales in the past and I am sure he will want to do that again in the future," said Baxter. "We've made no secret of the fact that we want all of our players to be ambitious. "We want them to be striving to play international rugby, not just for England, but for all the home nations. "For the club, it's fantastic to see Craig Mitchell back for Wales and it's unfortunate Tom Johnson has picked up his injury and misses out with England. "However, we are desperate to force through even more of our players into these international squads."